The White House is on track to complete new policies that aim to facilitate the sale of U.S.-built military unmanned aircraft systems to international customers and help U.S. drone manufacturers compete with Israeli and Chinese counterparts, Reuters reported Wednesday. The Trump administration also intends to relax international restrictions on U.S. drone exports through the renegotiation of a missile control agreement – Missile Technology Control Regime – signed in 1987 by 35 countries, government officials and industry sources told Reuters. The White House could release the new rules on military drone sales by the end of 2017 as part of a presidential decree that seeks to revamp U.S. weapons export policies, according to administration officials. General Atomics, Lockheed Martin, Boeing, Textron and Northrop Grumman are among the companies that are likely to benefit from the proposed drone export policies as part of President Donald Trump’s Buy American agenda. 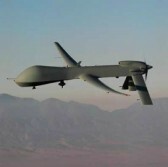 A senior U.S. official said the proposed rules would speed up military drone sales to a classified list of countries and an industry source noted that such a list would include U.S. partners in the intelligence alliance – Five Eyes – such as the U.K., Canada, Australia and New Zealand.